What is soil organic matter, how did it get there, and what does it do? conversion of molecules into organic matter. The organic matter is made of carbon, hydrogen and some oxygen, with most of the oxygen respired back into the air. All carbon in all life started as CO2 in the air and then entered the cycle of life by way of a growing plant. But what few notice is that the full cycle of carbon includes much magic hidden underground – literally. Although mostly made of carbon, hydrogen and oxygen, the plant also requires other nutrients to grow. For example, nitrogen, required for all amino acids, originates in the air, but enters the plant through the roots. The full array of micronutrients required for the plant to grow, including calcium, magnesium, iron, and dozens of other minerals, all originate in the soil and enter the plant via its roots. Even in the case of synthetic fertilizers, nitrogen originates from the air and minerals from the soil – just from hundreds or thousands of miles away. Manure – Manure is a complex array of partially digested plant biomass and diverse microbial life. It is the part of what was eaten that could not be readily converted into energy or the growing body mass of the animal. One of the key benefits of AMP grazing is that the manure is more evenly distributed across the land. This doesn’t simply dilute a problem – it creates an important soil carbon asset. When pesticide and dewormer use is avoided, insects (e.g. dung beetles) and worms actively tap manure as a resource – breaking it down and carrying it down into the soil. Trample – Trample is the fraction of the plant biomass left behind after grazing that is in contact with the ground. After grazing, some biomass is left standing and regrows, but some has been ground into the soil. Like manure, this biomass becomes a resource for worms, bacteria and fungi that break it down into nutrients. Although much of this ends up being respired by the microbes back into the air, some of it is incorporated into the soil and thus feeds the soil organic matter ecosystem. Root Exudates – The most significant pathway for growing soil organic matter is root exudation. Stated simply, plant roots leak – on purpose. Plants allocate anywhere from 10 to 40+% of the sugars they make via photosynthesis to feeding soil microbes. This sugar is the ‘paycheck’ by which plants ‘hire’ microbes to bring back the nutrients that plant needs to grow. Importantly, exudation is happening while the plant is growing. When grazed, the herbivore sends a plant back to the point of maximum rate of growth, and thus the maximum rate of exudation of sugars from roots. Thus, AMP grazing actually drives the force that ‘pumps’ CO2 from the atmosphere into the soil microbiome. Root sugars feed the soil microbiome more pervasively and to a deeper depth than manure and trample. Exudates enable cycling of nutrients from parent soil material at deeper and deeper depths over time in support of deeper roots. Manure, trample and root exudation work together to grow the overall volume of organic matter accumulated in soil. When we grow organic matter in soil, we are literally taking carbon from the air and putting it to work in soil in a cycle that helps grow more grass. Soil organic matter is like a soil carbon battery that provides the underlying energy for the cycling of life. If the grazing herbivore isn’t present, the air-plant-soil carbon cycle doesn’t work right and the battery goes under or uncharged. Peterson, P. R., and J. R. Gerrish. “Grazing management affects manure distribution by beef cattle.” Proc. Am. Forage Grassland Council, Lexington (1995): 170-174. Kögel-Knabner, Ingrid. “The macromolecular organic composition of plant and microbial residues as inputs to soil organic matter.” Soil Biology and Biochemistry 34.2 (2002): 139-162. Bais, Harsh P., et al. “The role of root exudates in rhizosphere interactions with plants and other organisms.” Annu. Rev. Plant Biol. 57 (2006): 233-266. Kallenbach, Cynthia M., Serita D. Frey, and A. Stuart Grandy. “Direct evidence for microbial-derived soil organic matter formation and its ecophysiological controls.” Nature Communications 7 (2016): 13630. 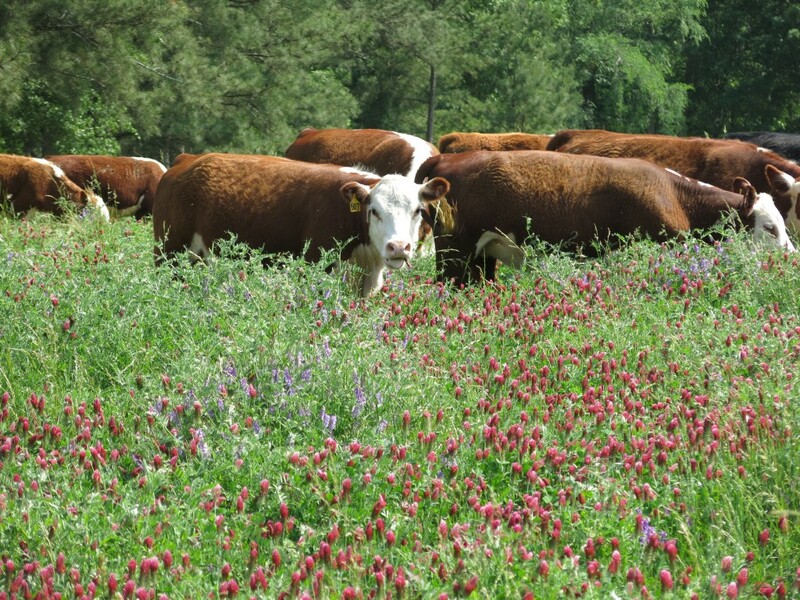 Allen recently wrote an excellent article for The Grassfed Exchange addressing common concerns about land area required for pasture-based beef production. We repost here in its entirety as it is directly relevant to our own mission…. Recently there have been a number of ads published in major agricultural publications that attempt to explain the “myths” of grassfed beef. In these ads, major companies such as Elanco and Certified Angus Beef (CAB) state that grassfed beef does not have any advantage over grain-fed in terms of nutritive value, that grassfed beef production is more harmful in terms of greenhouse gas production (GHG), and that it will always remain a very small niche in U.S. beef production because we simply cannot produce grassfed beef at scale, as there are not enough acres to do so. I addressed the nutritive value issue in an article earlier this year, showing that published scientific studies clearly state positive benefits for grassfed in terms of key nutritional components. I will tackle the GHG issue in the future. So let’s look at the “not enough acres” claim. For years now I have repeatedly heard from many different people in the grain-fed beef sector, university faculty, USDA personnel and even grassfed beef producers that we can grow the grassfed beef market only so much with domestic production because we do not have enough grassland acres available to finish at scale. Let’s take a look at the facts. First, what does it take to finish and animal on grass? To compare apples to apples, we need to define the finishing phase. I define it as the phase where an animal has stopped growing significant bone and muscle and is transitioning to fattening, with deposition of backfat, seam fat, KPH and marbling. That starts at around 800 lbs. for moderate-frame cattle. If we want our cattle to be well-finished, we need to take them to an average of 1,200 lbs. So 400 lbs. of weight have to be added in the finishing phase. If the cattle are gaining a modest 2.1 lbs./day during the finishing phase, it will take 190 days to gain that weight and get to 1,200 lbs. Their average weight during that 190 days will be 1,000 lbs. To achieve minimum average daily gains of 2.1 lbs., each animal will need to consume a minimum of 3.2% forage dry matter (DM) of body weight per day, which translates into 32 lbs. of DM. This equals 6,080 lbs. of forage DM consumed during the finishing phase, or roughly three tons. Soils with modest or better health profiles will produce anywhere from three to eight tons of forage DM per acre, and sometimes more. This means an acre or less is needed annually to grass-finish a beef steer. The main roadblock thrown up by many within and outside the beef industry is that there are simply not enough acres in the U.S. to grass finish in significant numbers. Let’s do that analysis. Over the past three to four years, grain-fed beef production in the U.S. has been averaging around 29 million head annually, which is our total grain-finished beef supply for both domestic and export markets. Current beef cow numbers will not support more production. How many potential acres do we have available in the U.S. for grass finishing? Every state in the lower 48 has a minimum of 200,000 acres of unused or underutilized grassland. Many states have a million or more acres of such grassland. These acres are not enrolled in a conservation set-aside program such as the CRP, are not in crop production, are not in cow/calf or stocker production, and are not comprised of public lands. They are simply idle grassland acres. Altogether, the minimum estimate for idle grassland in the U.S. is 15-20 million acres. At an average annual production of three tons of forage DM per acre, with proper grazing and forage management those idle acres can finish at least 10 million head of grass-fats annually. These idle acres alone could produce a third of the total U.S. fat cattle production. Next, let’s consider the acreage required to grow the corn, soybeans and wheat necessary to finish cattle in the feedlot. My friend Jim Gerrish, a consultant and former University of Missouri grazing researcher, looked at the acreage dedicated to growing feedstuffs for grain-finishing cattle. He found that 15% of the total corn crop typically goes to finish 29 million head of fed cattle on grain. The other 85% is used to produce livestock feed and ethanol. USDA estimates 2016 corn acreage at 94.1 million acres. If we take the 15% currently used to grow corn for grain finishing beef cattle and transition them into grass finishing, we would have roughly 14 million acres available. Soybean, wheat and other small grains are also part of feedlot rations, with the production from about 3.5 million acres typically required. Add those 3.5 million acres to the 14 million acres of corn, and we have 17.5 million acres of former cropland available for grass-finished beef production if there was no grain finishing in feedlots. At a minimum production of 5.7 tons of forage DM per acre annually, we have enough acreage to finish 32.9 million head of cattle on transitioned row crop acres (17.5 million acres times 1.88 steers per acre). Add these to the 10 million head we can finish annually on the idle grassland acres, and we are up to 42.9 million head of grass-fats. That exceeds current fat cattle production in the U.S. by 13.9 million head. Now let’s look at the more than 20 million acres enrolled in the USDA CRP program at the end of 2015. If we could take just 30% of these CRP acres and transition to grass-finished beef production, we would have an additional 6 million acres of available grassland. Having been in CRP production, that land will not be as productive initially. If we assume these acres will produce just two tons of forage DM annually, we can finish 0.67 head annually per acre, or a total of 4 million head. Now we are up to 33.5 million acres and 46.9 million head of grass-fats annually. Finally, Jim Gerrish estimates there are approximately 12 million acres of irrigated grassland in the intermountain region of the U.S., an area comprised of Nevada, Utah, Idaho, Montana, Wyoming, Oregon and Washington. These irrigated meadows will produce at least five tons of forage DM annually. If we take just 30% of those acres — 3.6 million — and transition them to grass-finished beef production, we can finish an additional 6 million head annually (3.6 million acres times 1.67 head/acre). Now we are up to 52.9 million head of grass-fats annually. That is 1.8 times the current annual production of grain-finished cattle in the U.S. on a per-head basis. Yes, we do have to account for weight differences at harvest, as the typical grain-finished steer produces 1.2 times the hot carcass weight of a grass-finished steer. The typical grain-fed steer weighs an average of 1,350 lbs. with a 64% dressed weight, putting the hot carcass weight at 864 lbs. A well-finished grassfed steer will weigh 1,200 lbs. and dress 59%, putting its hot carcass weight at 708 lbs. That is a difference of 156 lbs. per head harvested. Not enough acres to significantly grow the grass-finished beef market in the U.S.? You be the judge. Will we move to grass finishing 100% of U.S. beef production? No. We will continue to produce significant pounds of grain-finished beef. But it is a false argument that we cannot significantly expand grassfed beef production in this country. Let’s say we produced only 15 million grass-fats annually, with the rest of the beef industry remaining grain-fed. In this case we would need about 10 million acres of grassland, or roughly one-fourth the more than 37 million acres of grassland available for protein production in the U.S. calculated above. Thus there is the potential to have about 27 million acres available for expanding production of grassfed dairy, small ruminants, pastured pork and pastured poultry. It is worth noting that we are still learning how to build soil health, manage forage and grazing, and adjust genetics for optimum grass finishing. We have come a long way in this regard in the past 15 years, but we still have some learning to do. As we learn, we will become increasingly more efficient and effective at grass finishing. We have to remember that it took at least a couple of decades for the feedlot industry to hit its stride. Think of the possibilities. Think of the impact millions of acres of additional grass-based agriculture would have on the rural economy and the small towns all over the U.S. The acreage is available. We just have to use it wisely. Note 1: At $4.00 per bushel, an acre of corn producing 170 bushels generates $680 of gross income. The same acre devoted to grass finishing will generate $3,128 [(708 lbs. hot carcass weight/steer X $2.35/lb.) X 1.88 animals/acre]. Note 2: The argument has been made that grain-finishing is more efficient, and that fewer animals are thus required to produce a certain amount of beef. Fewer cattle supposedly create fewer GHGs. However, there is a major hole in that argument that I will address in the future. In any event, is it really in the best interest of beef producers — and agriculture as a whole — to reduce both beef and farmer/rancher numbers? Which of you wants to get out of the beef business simply because we no longer need you?